The law says that a corporation is a legal “person” separate from its owners. The age of the owners do not necessarily correspond with the age of the companies. When the H.J. Heinz Company advertises that it was established in 1869, it does not mean that all of the shareholders are well over 100 years old. It simply means that the company was filed in that year. You can take advantage of similar credibility benefits when advertising to customers. The age of your company can give greater credibility to customers and lenders than a business that was recently established, especially if the length of time that you have been in business is equal to the age of the company that you acquire. For example, let’s suppose you have been in the plumbing field for 12 years. Your attorney and accountant recommend that you incorporate for liability protection and tax savings. So, you acquire a 12-year-old aged corporation that corresponds with amount of time you have been in business. This way, when you advertise that you have been in business for a dozen years, if a potential customer looks up you company, they will see that your corporation filing date will correspond with the amount of time you have actually conducted business. Likewise, acquiring companies and other active businesses with established credit and existing credit lines as well as building credit on your company can give the business a big financial boost. It is responsible to note that age is certainly not the only factor in borrowing and business credibility and we recommend full disclosure as to the date that you acquired the aged company. We have very affordable programs that can help quickly obtain business credit. Beware of organizations in this day and age that say you can get a company that already has credit lines attached to it. If you want to acquire an aged company, give us a call. After you acquire it we can help you build credit on it. Companies Incorporated offers many such corporations and LLCs. There are many aged shelf Nevada corporations, Delaware corporations, Wyoming corporations, offshore/international corporations and Canadian Corporations available. The most valuable such companies for quickly acquiring and building a business may be shelf corporations. Companies also exist in this country that already have corporate credit scores and established relationships with lenders, though these companies are often active operating entities. 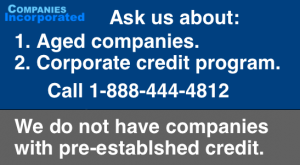 Companies Incorporated has a special package that includes an aged shelf company plus a program where we build a corporate credit score with Dun & Bradstreet and other credit rating agencies. We can arrange contact with lenders who, upon approval, can help arrange credit for business expansion, business supplies, and real estate purchases. Another program that is available is real estate training, consulting and a supplemental credit building program. We arrange for an experienced real estate investing expert who has earned over $1 million in real estate to come to your home town for two to three days and provide an intensive training program. This includes analyzing properties, making offers on properties, if the appropriate investments are available, and showing how to finance the property for as little money as possible for the transaction. The previous title to this page, referring to aged shelf corporations with established credit and existing credit lines was placed for SEO purposes because our research indicated that there were numerous searches for that term. We have recently changed the title to more closely reflect the subject of the page. Note: The program discussed below is no longer available and is for reference only. Help obtaining credit for Real Estate, usually up to $1 million maximum – You will receive a corporation or LLC. You submit real estate purchase proposals for funding. You can, subject to loan approval, receive up to $1 million in secured credit for real estate first mortgages by a lending institution. Plus, we have relationships with many additional private lenders who are willing to lend to corporations as well as individuals. Naturally, the lender will first need to verify that the property value will support the loan amount and that the loan is safe for the lender through approved underwriting before each transaction is funded. As any reasonable person would understand, having a corporation or LLC, in itself, does not enable one to walk into a financial institution and be showered with dollar bills. So, our trainers simply teach you how to invest in real estate and how to take ownership of the property in your company name. Our network and our associates have arranged millions of dollars in financing for clients. We are not mortgage brokers, so we do not earn commission on the loans. We simply help to arrange loans and refer you to the appropriate lenders. HOWEVER, NATURALLY, THERE IS NO GUARANTEE THAT ANY PARTICULAR TRANSACTION WILL BE FUNDED. THE DISTRIBUTION OF THE CREDIT IS SUBJECT TO APPROVAL OF LOAN SAFETY BY THE LENDER(S). One-On-One Training – We send an expert who has earned over $1,000,000 in real estate to your town to train you on how to obtain real estate credit and how to maximize your return when investing in real estate. This is a two to three day training. This is not classroom training. This is individual 1-on1 hands-on, face-to-face training in your town. The trainer will look for properties with you, will show you how to put together the offer together, usually with little to no money out of your pocket, and how to make the most money investing in real estate. The management of Companies Incorporated has been offering this training program since 1994. We believe that about every client who has participated in the one-on-one training has been extremely satisfied. Whether you are a new or experienced real estate investor, we are confident you will be very satisfied with this one-on-one training. You will cover the trainer’s travel fees. The reason for this is that whether the trainer needs to walk across the street or travel across the country, we want to make sure you have the minimum expense and do not want to mark up the cost for everyone because the travel costs vary. A typical cost may be six hundred for round trip tickets and two hundred a day for hotel and food. So, the cost is very minimal. Additional Credit Lines for Non-Real Estate Purchases – A corporate credit builder coach, who will work with you to build your corporate credit report, including structured program with and toll free support line. Your coach we will work with you so you can use and build additional credit for your needs and obtain a Dun & Bradstreet credit score subject to your proper participation in the process. See our list of available aged companies here. After the lender has verified the value of the property securing the loan, and has approved the transaction through standard underwriting procedures and sufficient loan safety, up to $1 million will be wired into escrow on a deal by deal basis for the purchase of real estate or other secured items. Again, this is not a guarantee. Funds are disbursed only after a lender has agreed to finance a particular transaction. Credit is also available for a wide variety of business equipment, automobiles and other items that can be tailor made for your needs, subject to lender approval, that can be obtained as part of the corporate credit coaching program. Real estate financing is available for residential, commercial, land or other real estate as well as other secured property or equipment. Your trainer will show you how to prepare acceptable offers to purchase property using the corporate credit. The trainer will also show you how to prepare offers that do not require a cash down payment. Will the corporation or LLC have a Dun & Bradstreet (D & B) number and “Paydex®” score? Yes. A D & B number, submission for Paydex score and corporate credit building program is part of the additional credit lines support program. You will be assigned a corporate credit coach who will perform a majority of the work in the credit building program. Can I use the funds any way I want? It depends what you want. If the transaction makes business sense for both you and the lender and is within reasonable safety parameters, yes. The money will be wired, subject to lender approval, into escrow to purchase items such as real estate or paid to the corporation or LLC from which you are purchasing other items. The lender has great flexibility but no successful lender will blindly wire a million dollars into your account without first taking a look to be sure there is sufficient value to secure the loan in addition to analyzing other loan-safety parameters. All or nearly all of the clients who have followed the instructions taught in the one-on-one training and followed the advice have been able to obtain some form of financing. Can I borrow money without using my own personal credit? Yes. The secured credit for real estate has traditionally been available with 100% corporate credit without regard to personal credit scores, depending on lender requirements. Alternatively, the underwriter may have you combine company’s the strength with your own to boost your borrowing power. Naturally, this is subject to the safety of the loan to the lender. In recent times, more lenders are looking at parameters other than business credit. So, it depends on the lender. How in the world can you do this with today’s tight credit market? We have lenders who have, for many years, built up networks of private investors who invest money in real estate mortgages. So, rather than working with banks, our lenders fund the credit distributions from its vast network of private investors. Again, we help arrange loans and refer the lenders only as a service to you. We do not receive commissions from the loans. Can I use the corporate credit to purchase the corporation or LLC, credit program or real estate training from you? No. You must purchase the corporation or LLC, credit builder and/or training program with your own funds. Can I put some of the cash in my pocket? There are ways to structure real estate transactions so that when the property transaction closes, you are able to receive cash back in your pocket from the purchase of property, though this is not guaranteed. The methods used will be taught in the training course. Who approves of the loans and real estate or other purchases? The training course will show you how to make acceptable offers and the lender approves of the financing transactions. Do you provide real estate investments for me that I can purchase using the corporate credit? Whereas you can use the funds to purchase any acceptable piece of real estate, investments that have been pre-screened by the instructor of the course are often available if desired. This is as a convenience only and, you are not required to purchase these properties. You can use the funds to purchase other properties that you find apart from those offered in the course. What kind of real estate can I buy? Residential, single family, multi-family, commercial, foreclosures, raw land, single family, foreclosures, developments, rehabilitations including the associated materials and labor costs. Details are taught in the training course. Can I obtain 100% financing without taking cash out of my pocket? Yes. The methods in which the 100% financing is structured are taught in the training course. Other methods are taught where a down payment is needed, either from you or from one of your associates. Can I get more then $1 million credit? The initial maximum under our program is for $1 million, subject to review of the value of the real estate and lender underwriting procedures. By following the training you can learn how to increase the amount that can be borrowed. It is the same answer if someone were to ask you, “How much does a car cost?” It depends. It depends on the market interest rates and the risks of the loan. As of this writing, low-risk loans, where the corporation or LLC will be used to help you purchase a home in which you will reside, interest rates are 5-8%. Medium risk loans, such as short-term rehabilitation financing are 9-12%. High risk loans can be thirteen to twenty-four percent. High risk may be for properties near hazard areas or for high-risk short-term construction. It also depends on the state in which the property securing the loan is located because there are different interest rate requirements in different states. The above numbers are examples. Because of the interest rate variations over time and other factors we do not make promises on what the interest rates our lender(s) will charge in the future. Can I use the credit to refinance properties that I now own? Can I build credit on a corporation or LLC I already own? Yes, we offer a program where this is possible but it would take much longer than and would cost about the same as purchasing an existing corporation or LLC with the credit lines. Can you prove that other client’s corporations or LLCs have been approved for the credit? Yes. It can be proven that several hundred loan distributions have been made to the lenders’ clients. We have received letters from the lending institutions that have approved the credit subject to real estate funding proposals that pass their underwriting procedures. The lender and its network of funding sources will work to obtain preferable rates. Though the amount has been established, naturally, lender will need to be sure that the property value will support the loan and that the loan is safe to the lender. Do you have other clients who have done this successfully? Yes. One of our clients in Spokane, Washington started with nothing and told us that he had built a $6 million net worth by following the training. Two other clients in Florida indicated they purchased $450,000 in business equipment within the first two months. Another client was a police officer and became a real estate investor. Another client earned more on his part-time real estate investment activities than he was on his job. Naturally, results vary. The program will only work if you do…and follow the training. What percent of people are successful? We are told by one of the course trainers that 87.3% of the clients who have gone through the training programs are engaged in one or multiple real estate transactions. The few remaining people are either in the process of acquiring deals or have not put forth the required effort as taught in the course. Yes. We have started doing business in 1906 and are wholly committed to your success. We have a strong incentive for you to be successful for three reasons. 1. Taking care of our customers is the right thing to do. 2. It makes business sense for us because most of our business is through word of mouth referrals from happy customers. 3. When you are happy you will be more likely to be a repeat customer. Our goal is to satisfy your needs and to have a long-term relationship with you. That is why we fully disclose that the funding is subject to one of our associated lenders approving each transaction and we do not guarantee financing of any particular transaction. Please click the link for an actual example of how one of our many clients used one of his Shelf Corporations with Credit and/or newly formed companies to earn over $300,000 in profit on his first transaction. What Will I Learn From the Training Course Associated With the Company? Do You Have Testimonials from Existing Clients? Yes, please click on the video below and you will see actual student(s) who have used the credit program and students who have attended the courses. This is the same video that you may have seen by clicking the link above and scrolling down to the testimonials section. I have a particular property I want to buy. Will your program work for it? Just about any real estate transaction can be funded through this program if there is sufficient safety to support the loan and it meets the lender’s requirements. One of the biggest mistakes a real estate investor can make, however, is to fall in love with one property. Many of the most successful real estate investors make several offers every week. What our program can do is to tell you if the deals you have in mind are or are not to your benefit. The very experienced consultant that comes with the program will help you sort out the good from the not so good real estate transactions. Moreover, the training course tells you where to find the most profitable transactions and how to properly structure your offers. Very experienced and very new clients consistently say they enjoy tremendous benefits from the training and consulting. We suggest that you watch the DVD training courses or attend the live courses prior to using your consulting time so that you and your consultant will be on the same page. The difference between this and a traditional line of credit is as follows: With a traditional line of credit an appraisal and loan safety analysis is performed before the line of credit is granted. However, with this program, since the property is presented to the lender after the conditional credit is presented, the appraisal and loan safety analysis is performed afterwards, and the portion of available credit is allocated to the particular project if and or when the appraisal and loan safety analysis is favorable to the lender. Will my personal credit score be involved? Your personal credit score is not necessarily a part of the approval process. If the underwriter might asks for it, it may or may not be so much for loan qualification purposes as it is to verify the integrity of the person who controls the corporation or LLC. In other words, if the president or manager of the corporation or LLC has bad credit it does not necessarily effect the loan approval, depending on lender requirements. However, if the person who controls the corporation or LLC has a continuous pattern of fraudulent activity that has resulted in fraud judgments on the credit report then it would likely be a matter of honesty. So, bad personal credit may or may not have as much weight, depending on the lender’s requirements, but habitual lack of honesty does. In recent times lenders are more concerned about the personal credit of the owner of the corporation than they did in the recent past. How long does it take to get a transaction financed? Soon after the lender is satisfied that there is sufficient loan safety and the lender is willing to fund the transaction. We do not make promises on the time it will take to close a loan, however, the loans tend to close faster than traditional lenders. Adequate time is needed to analyze the transaction for lender safety. Remember to give yourself enough time in order for the lender to do the due diligence required. The lender will not bypass the required loan safety procedures simply because you are in a hurry. They will not forgo underwriting because you will lose the transaction if they don’t fund it on your timetable. They will not bypass security guidelines because you will lose money that you have spent for earnest money, appraisals or other items. They will fund it when they are satisfied with the loan safety and when the lender is satisfied that it is safe to fund the transaction. So, give yourself sufficient closing time to allow for this need. was just financed for one of our clients. corporate credit provides cash for a first mortgage. The second mortgage loan payable to the seller was the other 50% of the purchase price. borrow $150,000 to fix up the property. $650,000 on a $500,000 purchase price. Enhanced Credibility – When advertising, customer trust is enhanced when statements such as “Our company has been in existence since…” This is of true significance when you have actually engaged in business in the particular industry for the specified time period rather than the number of years a company has been on the shelf. Corporate Credit – Sometimes it may be easier when establishing credit with banks, suppliers, investors and venture capitalists to have an older company. Though this may be a minor factor among other, more significant factors, such as creditworthiness and profitability. Just like any recently attained business, we recommend full disclosure that you have recently obtained the aged entity. Companies Incorporated has a list of established companies that are available for immediate purchase. The companies are sold on a first-come, first-served basis. There are corporations available that have established bank accounts and credit lines. We may or not have such companies available. The companies are free from tax or legal liability. One exception may include California corporations where an annual franchise fee is due. The real estate course trainer has a multitude of clients who are involved in one or multiple real estate transactions using their companies that were acquired through our service. One of the biggest parts of the program is education. We are offering a corporation or LLC and training on how to use it to buy real estate. Our program is unique and, to our knowledge, an identical program is not offered by any other organization. There are expenses we incur on your behalf when we provide you with the corporation or LLC and the associated training and consulting. Because these expenses are not recoverable by us they are nonrefundable items. To fulfill some loan requests, the loan may be referred to third parties. The loan fulfilled through the third party may or may not require the use of the company that is being purchased through this program. We will strive to satisfy your needs to the best of our ability within the scope of our program. Companies Incorporated can also provide a virtual office in and US state and many foreign jurisdictions including an address with mail forwarding, telephone number and fax number. This is for people who want to operate a business but do not want to use their home addresses for their business. We can also establish a US or offshore bank account for your corporation or LLC. You will have online access to your account as well as a debit card. For smaller amounts of money, you will use your debit card for purchases. For larger amounts, you will use the bank’s online service and wire money to those from whom you want to make purchases. Companies Incorporated provides the required “Eligible Introducer” letter to banks so that your account may be established without your presence. Naturally, we recommend full legal compliance and legal and tax counsel by an attorney and an accountant. Companies Incorporated routinely reviews and visits the most advantageous local and offshore banking and incorporation jurisdictions. We have relationships with banks worldwide and can tailor make a plan that best suits your individual needs. Real property prices and real estate lending programs are cyclical in nature. So, as a client you understand and agree that our program may change without notice. We provide service under this program for one year on an appointment, as available, basis. To order an Aged Corporation or Shelf Corporation (also referred to as shelf corps with established credit or shelf corps with credit program or shelf corps with credit lines or aged corporations with established Paydex TM scores), please call 1-888-444-4412, or internationally at +1-661-310-2688 and speak with one of our specialists who will gladly assist you. Please call Monday through Friday between the hours of 7:00 AM and 5:00 PM Pacific Time.